Rocks In My Dryer: Works For Me: Paint It Black! Works For Me: Paint It Black! We recently had the exterior of our house re-painted, and it turned out lovely. But it meant that the 25-year old light fixtures looked that much more blech. Thanks to our kitchen remodel, the house budget is a bit strapped, so I needed a creative solution to spruce up the old lights. Have a tip you'd like to share? Leave your clever WFMW tips below, and be sure to check in with the guidelines here first. Remember to link directly to your WFMW post, not to the front page of your blog. AND, while I have your kind attention, don't forget about the Fall, Y'all! Bloggy Giveaway over at my other blog. It'll be loads of fun! Be thinking about what you'd like to giveaway, and join us! 27. Mandy Houk (cure procrastination) - this link works, I promise! Wow, those little improvements are so drastic to the eye. I love it! You have inspired me. That might be just the facelift my house needs. I (and the home) thank you! it's a great change. nice work! Wow ~ those look really nice! Great idea!! Nice job! The black makes a huge difference. I'm such a scaredy cat about doing stuff like this, but I think I just needed to see these photos - it looks great! But I love your black paint! We had a white and bright gold ceiling fan in our old house, while every other metal thing we own is wrought iron. That fan drove me nuts but I couldn't justify buying a new one just for looks. So I got Rustoleum's hammered finish (paint and painted over all the brassy stuff and it looked wonderful! Now we're in another sprucer-upper, so I'm glad for the reminder about the magic of black! I am all over the resourceful and frugal ways to fix things! Wow, it's amazing what black paint will do. I love it! :) I'm going to have to try this around the outside of our house. I almost spent $300 on new light fixtures this past weekend but couldn't make up my mind which ones to buy. I'm so glad now. I'll have to try this first. Thanks. Okay, I am the Biggest Loser, no matter who the show awards the distinction to this season. First, I put up my link with no note about what my post is about. So I had to put up another link. And now, I have discovered that I somehow put both of those first links in wrong, so neither link goes to my post! So, I have thoroughly littered Shannon's lovely linky list with yet a third link. As if anyone would actually want to take advice from me now! I thought it was frosted glass! And I love your improvements. 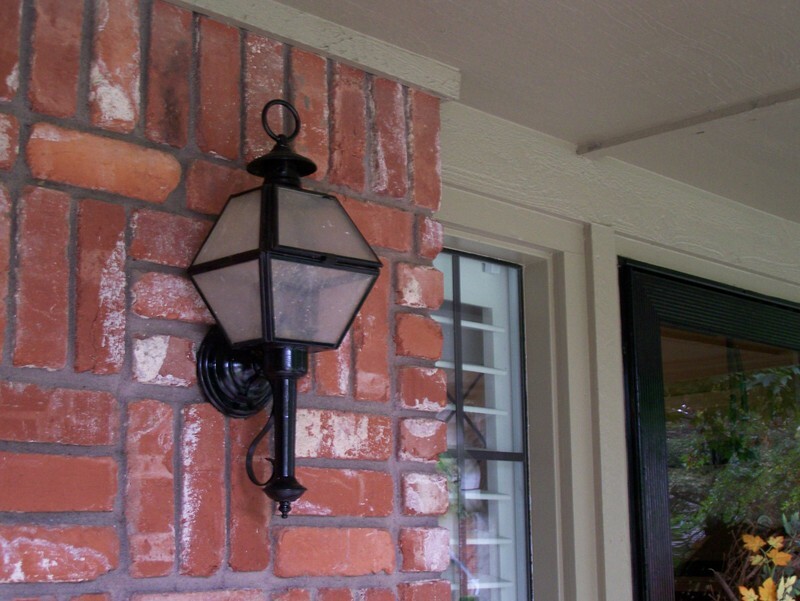 I did much of the same stuff in our old house, only I used matte black - gave it all a wrought iron look that somehow suited that place. Looks great!!! And I thought it was frosted glass too! I especially like the door frame. I love it, you clever girl! A few years ago I had a can of paint and was doing the same thing, painting everything in sight--except it was white. Couldn't stop. My WFMW this week is about how easy it is to use most Public Libraries these days. I really think that you did a wonderful job with the paint. Until you said something about the glass, my assumption based only on the pictures and not having seen it in person, was that it was indeed frosted. HeeHee. Ta for now dahling! I love the frosted glass and the black paint! It looks fantastic! I redid our bathroom a few years ago. I painted it to look like we were sitting in the ocean. The bottom of the walls is a blue green, with waves at the top of the water, then the next part of the walls is sky blue. Well, it looked so good, I decided to paint the ceiling sky blue too! Then put on pasty clouds and pasty fish. I love being in that room! So do all of our guests! Good thing I ran out of paint though....hard to tell what I would have painted next! 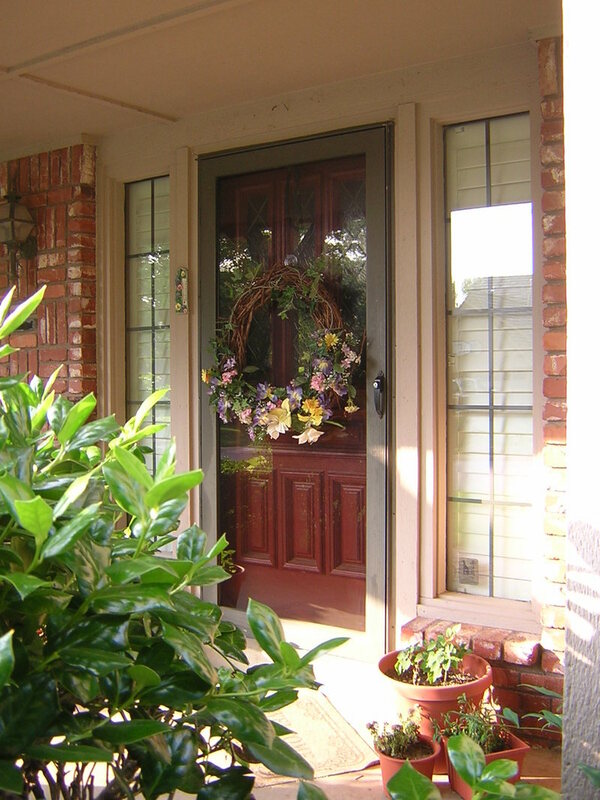 your front door area is GORGEOUS! I thought it was frosted glass too! Of course we can't see bug remains from here. Love the after's. My husband groans when he sees me looking intently at something. I must get a 'must paint now' look on my face. Wow - who would of thought a little black paint could make such a difference? I so need to do that around my house. I just need to budget the paint. I hate all the brass around the house. I can't wait to put a powder black paint over everything! LOL! I thought it WAS frosted glass, you shouldn't have told your secret! BTW, have you tried Bar Keeper's Friend? It gets rid of everything without scratching, so if you really don't like the frosted look, you might give it a try - look for it around where they sell the Ajax. lol, I thought it was frosted glass! Sometimes you can soak glass in an ammonia water mixture and it will erode away a lot of "film" that has built up. I've also tried water and oxi powder with good results! Amazing what a little paint will do! Great job! 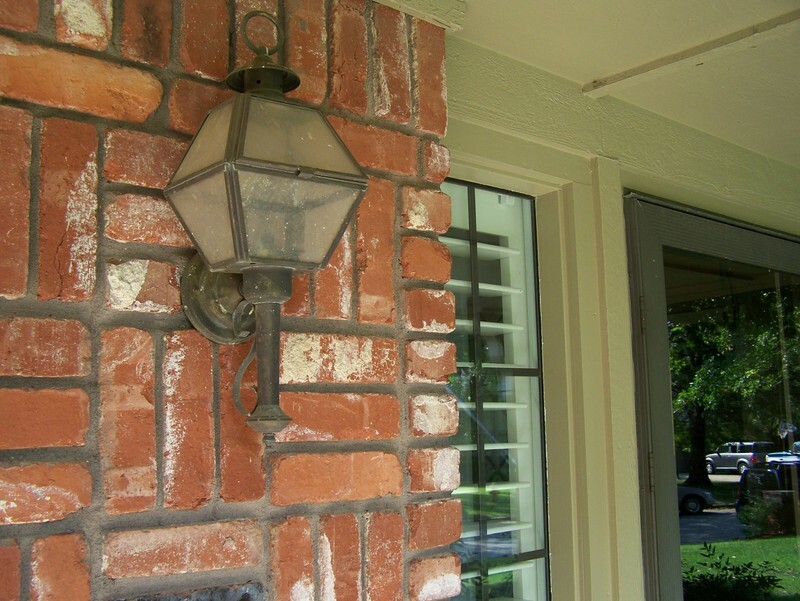 I used the hammered metallic spray paint on our outdoor light fixtures and lamp post. It was great! I know the feeling of looking around for what else you can paint. That reminds me of the time I was helping my mom to de-clutter. I was in the bathroom helping to make better use of the space and had added this black shelving unit I'd found second-hand. It was in good shape except for a few scratches. A couple of minutes with a black Sharpie later, and you couldn't see a single bad spot. But I couldn't put the Sharpie down. Every time I go into their bathroom now, I look for spots that I can Sharpie. That so good and renewed! I will have to go look for things to paint around the house. :) Great tip! Great ideas on the black paint. I am just itching to do this at my house. Will you please delete my first link? (#75) I accidentally linked back to your WFMW post. Love the new look. 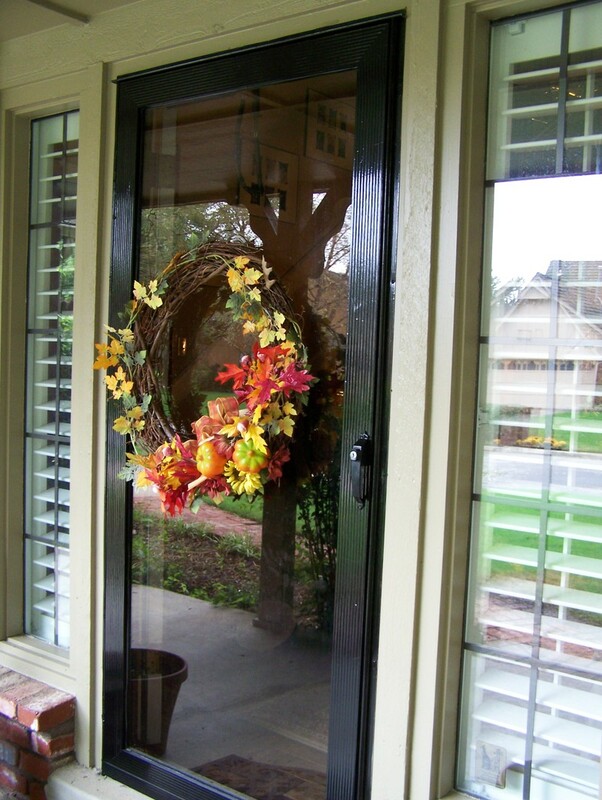 Your house looks lovely with the wreath on the door, too. As for the glass, my niece who lives in NYC asked about how to get the scum and grime off her windows and her mother suggested engine degreaser. Don't know if it works, but if the other stuff doesn't get the glass clean, you might give it a try! We have the done the exact same thing with the black paint. Did the shutters on the windwos too. Then we discovered black-colored mulch as well for our landscaping. Love it. Have you tried liquid sugar soap on the glass? If you can take the glass out at all, try soaking it, otherwise, just wipe it on straight, leave it for a tad, and then wipe off with a wet cloth. Should do the trick. That looks amazing! Who'd have thought? Thanks for sharing. I'm all over your tip this week. Black paint and I are good, good friends. Great tip! Just had to tell you that the black looks great!! Oh, yeah! I love me some black paint! We had these dated coffee tables that were off-white iron with glass tops. We painted the iron black, and replaced the glass tops with plywood upholstered with leather. The look really cool! It looks great! I am that way too though, once I start there is no stopping me, until the paint runs out or hubby says NO! Black is slimming too. Does that mean that if we stand next to the door we'll look thinner? Wow, it all looks so awesome! Amazing what a little paint can do! That looks great Shannon! I have to redo my house numbers to black. I looking for the paint brush now! Gorgeous! Neat how a little paint can spruce things up so much. Amazing! You did a great job. And, I thought the glass WAS frosted. Love the makeovers at your house! I recently painted some of my lamps in my house black...great color choice! Shannon, that is a fabulous tip! The results look great! I can't believe a little black paint makes such a huge difference! Great Job! 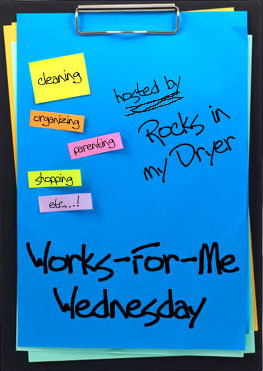 First time participant but have loved your WFMW tips for a while. My husband knows the Joys of Black Paint. He took a green welcome sign, painted it black, traced out the ornamentation in gold, and Voila! Brand New Welcome Sign. And then he painted the stair rails black. And painted the mailbox black. And the flag pole. And he was eyeballing the front door, and talking about getting new brass fixtures for that, but I took the paint away at that point. Having remodeled our inn (can you say "gutted it") .. your transformation.. is great.. Nice work! We have a saying we use quite frequently- "it's amazing how much ugly a little paint can cover up!" Niiiiice! You know I love me some paint! Looks great- amazing what a quick coat of paint can do. Wow! That black paint went a long way...it looks great! Really striking against your home...good job. Ohh, that's pretty. Nice job! Try soaking the glass panels (assuming they come out) in vinegar. A little paint sure does make a difference! The black trim makes each of the colors it frames pop! Nice job! Do you think I could do this to my outdoor lights that are bronze? We too just painted the house; grey with black shutters and I would love new fixtures, but the old would do with a facelift. Just wondering if the original has to be painted a certain color etc. They look great! Gotta love HGTV! First of all, sorry about linking directly to my front page last week! It was my first week and I am just learning this stuff! :) Anyway, I LOVE the black...it really changed that front door too! Great job! Oops! I forgot to say thank you last night when I linked. Where are my manners?! You know you really could have convinced us it is frosted glass....we would never have known. But, who cares anyway as your light fixtures look FAB! Isn't it amazing how a little fresh paint can do wonders and make you feel so good? Thanks for sharing! I HAVE GOT to try that! We've got several outdoor items that could use a good 'sprucing! Great tip! I'm getting me some black paint....and if you hadn't said anything, I'd thought that the light fixture WAS frosted glass. Great tip!!! It does look fantastic, though! How's the kitchen coming? I accidentally left two links. Sorry. This is my first time and I wasn't sure how to do it. Thanks for your site. I look forward to reading it every day!! Your improvements look great! Did you know that Lowe's also has a high-temperature black paint that's good for perking up older fireplaces? It's meant for grills, but it sure made my living room gas fireplace look great! Looks great. I know what you mean about not being able to stop. I have bookcases that the wood no longer matches what we are doing so I painted them. Even got my daughter addicted to it. She just painted the shadow boxes and a 3 shelf bookcase for her new room...dark purple. She's 18. The light fixtures do look great! I too am a bit obsessed with black paint--it does wonders. ROTFL painting the children ;). Great idea and they look WONDERFUL! I've been known to paint a whole set of shabby dining chairs & the table black - stick on red cushions & placemats and it works ;). Black paint is one of my best friends. I didn't stay outside when I went on my painting frenzy though. I did our kitchen table and chairs, the family room coffee table, the end tables, the cupboards in the mud room. I COULDN'T STOP, Y'ALL!! Lucky for me it all turned out terrific or my husband would have had a stroke! When we bought the home we live in, I had a very limited budget to work with and many, MANY light fixtures to replace... so I bought cheap construction grade lights, spray paint, and went to town. They look lovely! Some I bronzed, some I painted black like wrought iron, some I silver leafed... they all look amazing and so different than the tacky brassy finish they had!!! I love the black trim with brick look. I love a girl willing to take a risk with paint! I have kept DIY and paint in the ol' bag of tricks for several different things now. It looks awesome! Way to go! It's amazing how much difference something so little makes. Hopefully it was easy too. Chiming in ridiculously late, but ever since I read this, I've been looking at everything and imagining it painted black. That, and the Rolling Stones song is going through my head. What a fabulous idea! I have been thinking about buying some new black lights for outside, but I think I am going to take your idea and paint them instead. Love, love, love the black!! Very classy and elegant.